Klein, well, HE is the man version of Clarine. He is unbelievably beautiful. 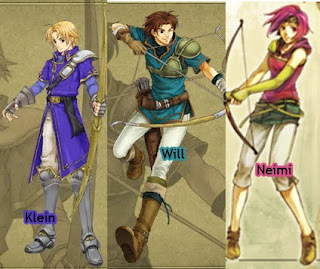 Klein is a son of Pent and Louise. Pent and Louise play role in Fire Emblem: Rekka no Ken. They are spouse. Pent is gorgeous husband and skilful sage, whereas Louise is lethal beauty wife and not-just-average sniper. These hubby and wifey have one son and one daughter. The son named Klein and the daughter name is Clarine. Both Klein and Clarine play role in Fuuin no Tsurugi. Klein is a general of elite squadron consisted of archers and pegassi. One of her subordinate, Tate seems to have crush toward him. Clarine, his one and only sister is very brother-complex. She always compares anyone to her brother. I once found that Clarine describe Roy, the main lord in Fuuin no Tsurugi, as a bad-hair-do man to Klein (laugh). Klein is kind of average skill. He is already sniper so that player can’t promote him again. Still, in Fuuin no Tsurugi, my favourite archer will be Wolt or Dorothy (but I don’t have their picture – yet). Klein brings white gem along with him – money bag! He comes from rich family so no wonder he bring that 10.000 gold valued gem. Or maybe the gem is for war funds (yeah, whatever). He can be convinced to join only by Roy or Clarine. Will is a starter characters from Rekka no Ken. He together with Lyn have journey to find the truth about Lyn’s heritage. Will actually looking for her best friend Dan who lost contact for several month. Rebecca (also archer) is Dan’s little sister. Will and Rebecca can make support conversation (if player get A level, they will get married. Ganbatte ne! And you know what?! Their child’s name is Wolt – also an archer – oh, my! That Wolt who takes part in Fire Emblem: Fuiin no Tsurugi (Sealed Sword)! Blood can’t be reversed). Will is very sociable among other. He is eager to learn and hone his archery skill. Talking about skill, Rebecca is better than Will but he is a candidate for player’s team instead of Louise. I wonder why promoted characters always have an average or worse crappy stats (sob). Well, never mind! Will is solid archer and won’t make player regret choose him. Neimi is a breathtaking archer. At first, player will find she is very vulnerable to enemy’s attack. I once play in Zaha Woods and suddenly get her killed by zombie. AARGH! Yeah, she is pretty weak at first, but with patient she is a formidable archer, yet sniper or ranger (Neimi can be promoted to sniper or ranger via Orion’s Bolt). Neimi is a cry-baby and pretty much handful. Her childhood friend, Colm is the only one that is survived from Grado invasion. Their village was burned down by Grado’s madness. Together, they help Eirika to find her twin brother and seek the truth of Grado’s invasion. Colm is a thief and love to sneak (well, that is his main job, isn’t it?). If Colm and Neimi have A level support conversation, they will be husband and wife in the end of game. Psst… I make fanfic about Neimi and Colm, the tittle is “Mou Sukoshi…” or it’s “Just a Little More…” in English. Ufufu... I hope I can finish it as soon as possible.